Background: Tuberculosis (TB) is infectious, contagious and persistent infection caused by Mycobacterium tuberculosis. The treatment of TB is becoming more complex due to development of multidrug resistant tuberculosis hence, it requires daily administration of combined drug therapy for six or more months. It is rational to formulate controlled release formulation to reduce dosing frequency and drug toxicity. Chitosan Nanoparticles (CHNPs) are optimistic approach to treat tuberculosis. 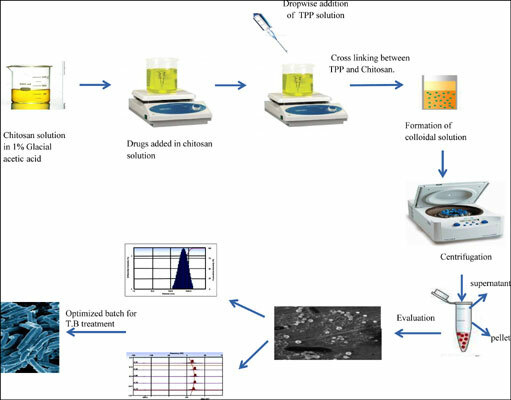 Objective: To formulate combined drug chitosan nanoparticles of antitubercular drugs (Isoniazid-INH and Pyrazinamide-PYZ) to get additive effect on Mycobacterium tuberculosis. Nanoparticles are colloidal system that enhances effective permeation through cell membrane, stability in blood stream and controlled release of drug. Hence, it is emerging as a new weapon in drug delivery field. Methods: The 32 factorial design was used to formulate nanoparticles by ionic gelation method using Chitosan (CS) and sodium tripolyphosphate (TPP) with ratio 3:1 (CS:TPP::v/v) in pH range 4.6 to 4.8. The effect of CS and TPP concentration on particle size, zeta potential, entrapment efficiency and in vitro drug release were studied. Results: Optimized batch 8N showed particle size 414.3 ± 2.71 nm, zeta potential 26.52 ± 0.67mV, PDI (poly dispersity index) 0.296 and entrapment efficiency of INH and PYZ 55.29 ± 0.06% and 63.14 ± 0.29% respectively. Dissolution release study of 8N formulation at pH 7.4 showed initial burst release of 20.28 ± 1.43% and 23.62 ± 1.07 at 0.25 hrs followed by controlled release up to 84.82 ± 2.54% and 61.48 ± 1.52% by INH and PYZ for 14 hrs. Conclusion: The study concluded that CS and TPP concentration were rate limiting factors in optimizing formulation development. Combined drug nanoparticle system has an innovative and optimistic approach towards the enhancement of therapeutic efficacy and reduction undesirable effects of antitubercular drug. Chitosan, TPP, tween-80, nanoparticles, tuberculosis, chemotherapy.